When we learned we’d be designing and planning a party to celebrate the collaboration between Boohoo and Paris Hilton, we couldn’t have been more thrilled. She’s socialite royalty, after all! We knew Princess Paris loves a few signature elements: pink, sparkle, and glamour. Deciding how we were going to create a space that incorporated all three and also hadn’t been done before made me hit the ground running. Hard. After many rounds of venue walk-thrus and décor mockups, I knew we had finally made the perfect choices for the festivities. Popular restaurant/bar Delilah in West Hollywood was heavily decorated from the inside out. On the exterior walls were towering art pieces of Paris (modeling the new line), blush lighting, and a bright pink carpet leading to the step-and-repeat. The indoor area was the perfect blend of femininity and fun: the room was bathed in pink uplighting and the glow of hundreds of candles, bunches of pink roses were nestled in vases on and around tables, and bedazzled framed photos of Paris were also placed throughout. 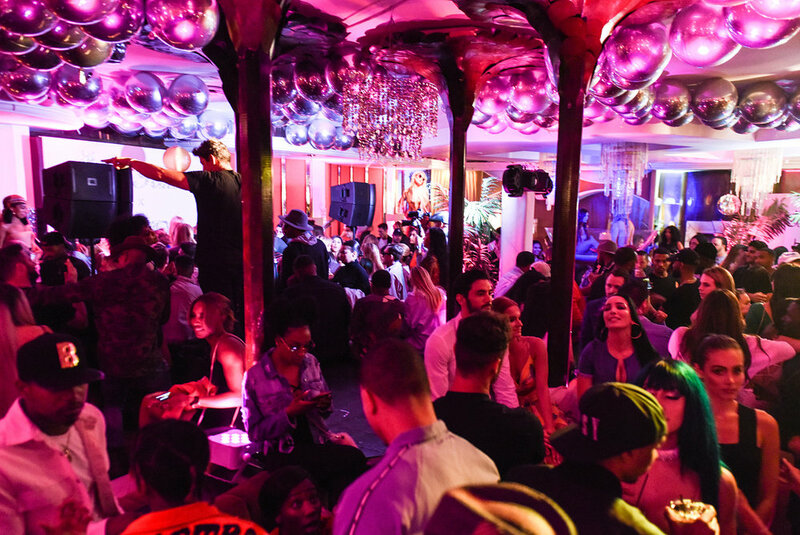 Our team designed an impressive lighting scheme, which was crafted to highlight the already-present plush seating and give it a rose-colored hue; couches were made complete with custom-made throw pillows emblazoned with the Boohoo x Paris Hilton collaboration motif. Paris arrived in a classic bubblegum-pink convertible and posed for media wearing a silver metallic Boohoo dress – one from her 70-piece collection – paired with sparkling accessories. Her celebrity friends showed up to support her new endeavor, including Paris Jackson, and later Lil’ Kim who entertained guests with a set of her hit songs. Even Paris Hilton joined in on the performance and sang! After confetti canons signaled the finale of the evening entertainment, guests mingled, or posed in perfect position in front of the wall bedecked with fresh florals and stacked Champagne glasses. It was definitely Instagram worthy and one of my favorite installations of the night with Shawna Yamamoto. In what is typically a private dining area for very high-end patrons had now become the ultimate playful indulgence of the night. An all-white suede bed appeared to float in a pit of white and silver balls. Except this one wasn’t the kind you played in at a kids’ funhouse! I worked hard on the creation of this – like literally on my hands and knees personally securing the nightstand next to the bed, for instance – and it turned out to be such a whimsical aspect. I was incredibly happy when Paris and Lil’ Kim took their turn to jump in the pit for an impromptu photo shoot. The friends “had a ball” trying on the tiaras, jeweled sunglasses, holding the stuffed Chihuahuas, and throwing around giant blowups I had placed around the section for mischievous photo moments. Even former Bachelor Nick Viall, and fan favorites Ashley Iaconetti and Jared Haibon, took a turn to hop in for some amusement. Paris Hilton and her fiancé Chris Zylka were so genuine and friendly, dancing with their friends the remainder of the evening. It made me feel truly happy to see that they enjoyed their time at the event. Thank you Boohoo for choosing me to design and coordinate, I’m grateful and I look forward to more fun and one-of-a-kind events together!